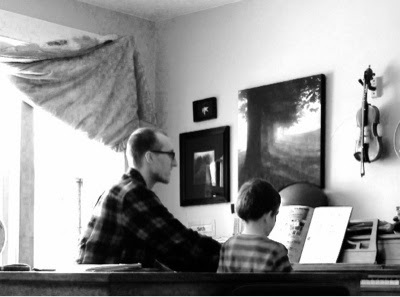 Little Mister started this fall with piano lessons from Yours Truly, but when he finished the beginning book, I knew we needed a teacher who knew more than I did about piano technique. I was lucky to find a good teacher who is willing to come to our house, a big bonus for a non-driving mom! I have been reading for a while, but had to comment this time and let you know that that photo is just gorgeous. I love the lighting, their expressions ... frame it!! !